Increase your pile of shards with some educated guesses. Valve has released a companion app for subscribers to Dota 2's premium monthly subscription service, Dota Plus. The app lets you keep track of match and tournament results, as well as keeping you informed about your favourite players and teams. And then it lets you place wagers on them. The Dota Pro Circuit app, available for iOS and Android, will let you make 'predictions' on upcoming matches in the pro circuit, wagering your own shards—the Dota Plus exclusive in-game currency—in the hopes of adding to your pile. All the information you get about teams and players, then, can be used to make your predictions. No cash changes hands, unlike in the third party gambling that surrounds the game, though technically those shards are linked to financial investment because the currency (and thus what you can spend it on) is only available if you pay for the Dota Plus subscription. That's $4 a month. That technicality isn't enough to make it gambling, however; at least not to rating organisations like PEGI, which has given it a 3 rating, essentially meaning it's appropriate for all ages. The Dota Pro Circuit app feels like the latest in a years-long stream of game systems which have been pushing the debate around gaming systems and how close they come to gambling to the fore, though. Probably the most well-known facet of the debate involves loot box systems which encourage players to open in-game Macguffins to obtain digital presents of variable rarity or desirability. Often these are boxes or chests you can earn over time in the game or choose to circumvent that grind using real money. Another facet is the third-party gambling and trading scene around games like Valve's CS: GO where players circumvent Valve's systems in order to use in-game cosmetics as a gambling currency. The real money comes in when players make payments via third party sites and then use the steam trade function to hand over their digital goodies. Despite the PEGI classification (and I should stress that PEGI do not set the legal definition of gambling, they're merely an enforcer), I'd argue the mechanics of the Dota Pro Circuit app's predictions are a lot closer to real-world gambling than, say, Overwatch's loot boxes. 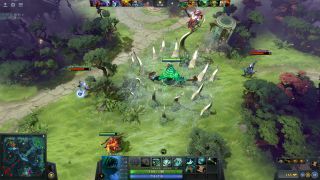 You can study the teams, check the odds, place a bet with a cash stand-in, get that thrill when you get a shard windfall—the most significant difference is that it's all taking place within Dota 2. You can't head to the bank with your pile of shards and make a nest egg. It's a new grey area in a debate filled with grey areas. The app's available now, and you can check out the full feature list here.